Oakley Commercial have confirmed the completion of the sale of a popular business centre, Maritime House, located within Shoreham Harbour, close to Hove Lagoon. The site comprises a substantial three-storey office building, a two-storey workshop / studio building with a large communal car parking area with substantial wharf frontage. The main office building extends to 11,800 sqft / 1,100 sqm with an additional 5,500 sqft / 510 sqm within the workshop / studio building. The building will continue to be operated as the Maritime House business centre and has been purchased by the Port as an investment, so they can continue running and improving the business centre. Steven Harvey, Commercial Director of Oakley commented "The building was originally a site for the MOD and used by HMS Sussex, the site and buildings were acquired over 20 years ago by Maritime Atlantic Ltd, who then converted the building into a serviced office centre, which has traded very successfully. Maritime Atlantic decided to sell the property as they wished to focus on their core marine businesses. There were fears that the building might be converted to residential use, as part of the sales offer was that the property had recently secured consent for residential development, under the permitted development approval process, allowing the upper floor offices to be converted to residential. 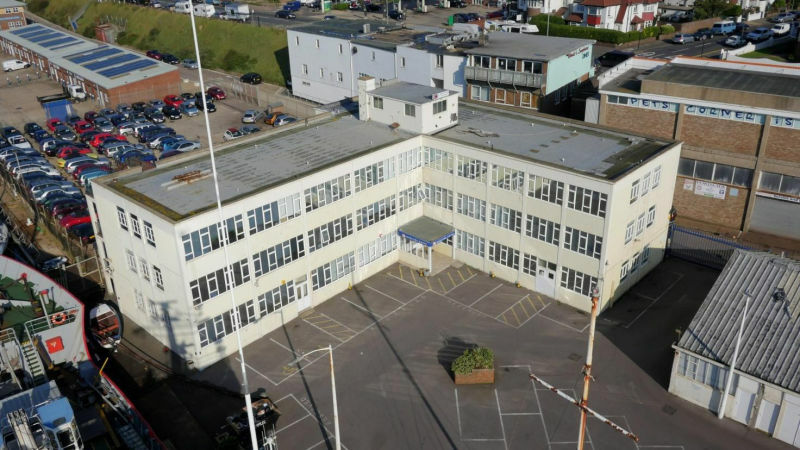 However, Tim Hague of Shoreham Port confirmed 'we are delighted to have been able to secure Maritime House in the open market and we can confirm that this will safeguard its future as an employment site". Acting on behalf of Maritime Atlantic Ltd, Oakley extensively marketed the complex to investors, occupiers and developers, which culminated in a formal sales tender by a way of best and final offers. Oakley are pleased to announce that the property has been sold to Shoreham Port Authority for a sum in excess of the guide figure of £3m. This latest acquisition by the Port accords with the Port Masterplan, which is focused upon ensuring that the Eastern Harbour Arm remains as a location for port related and employment activities. Atlanic Marine LLP, the sister company of Maritime Atlantic and ship owner, will continue to remain at Maritime House in the long term and are pleased to support Shoreham Port with their aquisition. For further information in relation to the sale, please contact Steven Harvey.